Once in a while, we should compulse over well-established paradigms, and I have been thinking about the terminality of differentiated epithelial cells. There are many believers in terminal differentiation, but if the concept encourages a sense of immutability, then does it cripple new ideas regarding the plasticity of transitions among mature epithelia? I think so, and my apostasy is this: Although epithelial cells differentiate to expected levels of function, they are not necessarily terminal. Mature epithelia occasionally morph into other phenotypes depending on the availability of somatic cues that engage new molecular programs. If this argument is defensible, what are the merits? Some brief outline of epithelial maturation may be a good starting point. Early patterning of epithelial tissues requires specification and expansion of new cell lineages. Under temporal exposure to biochemical drivers and inductive signals, a developmental periodicity shapes the forward differentiation of epithelial cells forming functional units as tissue structures. Periodicity in biologic systems is called diapause. 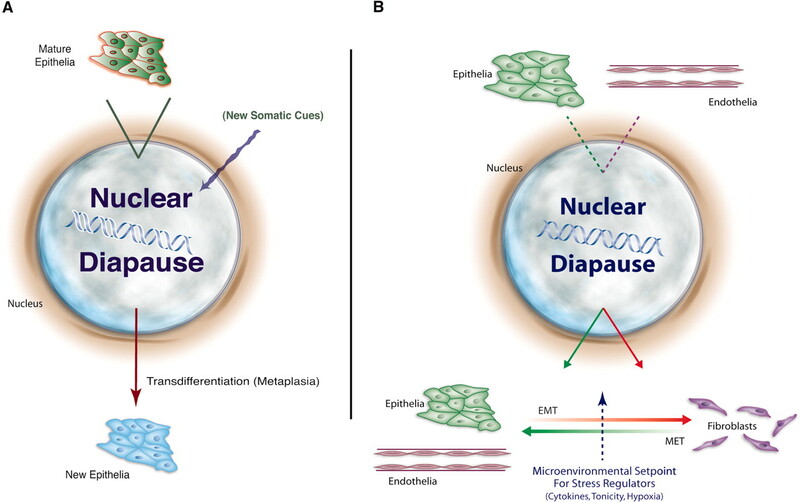 Nuclear diapause in cells, as I define it, denotes a modulated period of chromatin stability surrounding intervals of developmental change. Polycomb/trithorax group proteins and methylation domains in clusters of non-coding elements near coding sequence for lineage-appropriate transcription factors may orchestrate such diapause epigenetically.1,2 Hypothetically, these control elements gradually limit access to more chromatin and eventually stabilize maturation. Under such conditions, epithelia remain diapausal in the nucleus and function appropriate for the cell. Mature epithelial cells that reach this stage of development have a centriole-derived primary cilium and stop proliferating,3 join neighbors by intercellular attachment, and regionally polarize, as needed, through the asymmetrical assignment of surface proteins.4,5 In this relative state of mature cell life, what is popularly called terminal differentiation is really just an evolutionary pause maintained by signaling events, transcription factors, and genomic setting.5–8 Normally, little else really befalls these epithelia except to divide, hypertrophy, die apoptotically, or undergo dysplasia.9 Does referring to this diapause as terminal out of habit or expectation create special value? No rigorous tests are performed to assess terminality, and I suggest at this point no one really knows what these tests might be. The first is the process of epithelial transdifferentiation. Transdifferentiation describes the conversion of one mature epithelium into another with or without intervening cell divisions—pathologists call this metaplasia. Such plasticity has been documented both in culture systems and in vivo. The definition of transdifferentiation requires interconverting cells to derive from the same ancestral lineage without producing heterokaryons expected from cell fusion.9,12 Implied in this notion is mature epithelia, although not multipotent, have some degrees of freedom in reprogramming their chromatin and changing their phenotype in response to new somatic cues (Figure 1A). Interconversions, for example, have been observed above the gastroesophageal junction, where stratified squamous epithelial cells become columnar, like the intestine, to form Barrett's esophagus13; in type B intercalated cells from the renal collecting duct that change into type A intercalated cells;14–16 in type 2 pneumocytes that transdifferentiate into type 1 pneumocytes in the lung;17,18 in neural retinal cells that morph into pigmented epithelia;19 in retinal pigmented cells that become lens epithelia;20,21 in lactotrophs that interconvert to somatotrophs in the pituitary gland;22 in pancreatic exocrine cells that become hepatocytes;23–25 and in hepatocytes that transdifferentiate into insulin producing cells.26–29 All of the drivers underlying these conversions are not understood, but a couple of examples are illustrative. Two forms of plasticity in epithelial cells. (A) Transdifferentiation (metaplasia) occurs in diapausal epithelia challenged by new somatic cues. Such stressors are not fully understood but include partial duct obstruction; chemical or toxic demethylation of chromatin; transposon-activated developmental programs; or new environmental cues, such as acidemia or alkalemia. (B) Epithelial or endothelial-to-mesenchymal transition (EMT) in adult tissues produces fibroblasts, a process that is balanced by mesenchymal-to-epithelial transition (MET). Epithelial cells and endothelial cells (a specialization of squamous epithelia) undergo EMT when stimulated by microenvironmental stress regulators, such as hypoxia, tonicity, or cytokines. These stimulants induce transcriptional activity in the nucleus to engage a molecular program for phenotypic change. Drivers in the direction of MET can leave the cell in diapause at its original set point (blue dotted arrow) or somewhere in between. Transdifferentiation also occurs in cells formed out of anterior foregut endoderm by the interconversion of pancreatic epithelia and hepatocytes. Partial pancreatic duct obstruction in primates produces ductal hyperplasia and new endocrine tissue with a scattering of unexpected hepatocytes.32 Pancreatic exocrine cells in mice that overexpress keratinocyte growth factor33 or a transcription factor called C/EBPβ25 also switch into hepatocytes. Conversely, overexpression of the transgenes encoding Pdxl26,27 or Pax429 in hepatocytes converts some of them into insulin-producing pancreatic cells that rescue hyperglycemia in diabetic mice. A more physiologic example of transdifferentiation is suggested in the kidney. The renal collecting duct is home to intercalated tubular cells, which secrete H+ ions (type A cells), HCO3− ions (type B cells), or H+ and HCO3− ions (type non-A, non-B cells) into tubular fluid.16,34 These highly differentiated epithelia change phenotype by re-addressing H+-ATPases and Cl−/HCO3− exchangers to either the basolateral or the apical cell membrane and by modifying their apical surfaces. Interconversions forming these two mature phenotypes are occasioned by the acid-base demands of the host.16 Although there is some debate as to how many intercalated cells have intermediate phenotypes and whether type A or type B cells along the nephron derive only from the intermediate form, it is clear from cell culture studies that mature type B cells can become type A. An extracellular protein called hensin modulates this transdifferentiation, and type A cells emerge columnar with microvilli, whereas type B cells are neither.15,34 This conversion has been considered a terminal event,14 but one can equally surmise that intercalated epithelia in nuclear diapause morph into function-appropriate phenotypes under pressure from new environmental circumstances. A second form of plasticity in mature epithelia is known as epithelial-to-mesenchymal transition (EMT).11,35 Primary EMT occurs during gastrulation, when primitive epithelia transition to primary mesenchymal cells for dispersion into the emerging body plan.36 Secondary EMT is seen among differentiated epithelia that transition to interstitial fibroblasts during organogenesis36 and is well described in tissue epithelia from the kidney, eye, liver, and lung undergoing fibrosis.35–40 Fibroblasts are different from mesenchymal cells, because fibroblasts are not as multipotent and selectively express fibroblast-specific protein-1.36 This protein is found in all fibroblasts or secondary epithelia in transition to fibroblasts.41,42 A variety of local environmental stressors regulate the tendency for epithelia or endothelia43 to leave their diapause and transition toward EMT. This transition is counterbalanced by forces that drive mesenchymal-to-epithelial transitions (MET) in the other direction. Drivers for this bidirectional movement include levels of cell stress from hypoxia44,45 or tonicity46 or variable pressure from local cytokines.10,11 Figure 1B illustrates this dynamic as dependent on outside-inside signaling that engages transcriptional modulators such as CBF-A, Snail, Sip1, Twist, HMGA2, LEF, β-catenin, and Smads. Recent evidence suggests that CBF-A binding to FTS-1 sites in the promoters of genes encoding some of these other transcription factors may be a master regulator for the induction of EMT.47 As a hypothesis, one can view epithelia leaving their nuclear diapause as enabled for transition by variably moving along a horizontal set point between EMT or MET, without necessarily going to completion. Disruption of underlying basement membrane by local proteases and persistent cytokine activity during tissue inflammation can certainly initiate the process of secondary EMT in fibrosis.36,48 Rather than collapsing into a tubular lumen and dying, some secondary epithelia become fibroblasts and find their way back into the interstitial spaces behind disaggregating tubules through rents in ruptured basement membrane.42 Although there are other drivers, FGF-2, EGF, and TGF-β are among the classic modulators of EMT.48 Activation of their cognate receptors, in some cases, is modulated by the availability of various trap proteins.36,48 Because fibroblasts derive from secondary epithelia, it is not surprising that fibroblasts from different tissues also behave distinctively in response to local cytokines and matrix proteins. These regional differences might reflect subtle variation in imprinted features from their epithelial precursors.10 New observations also purport that the transcriptome of regional fibroblasts may be ordered topographically by epithelial somites, perhaps based on a “Hox” code.49 Consequently, fibroblasts formed by EMT may differentially express genes or signaling pathways dependent on their previous life as mature epithelia and theoretically could be as heterogeneous as the universe of epithelial cells. Additional evidence indicates that EMT, up to a point, is reversible,50 such that epithelial units can be restored in the appropriate somatic context with the correct mix of morphogenic drivers that push EMT in an opposite direction toward MET. The press to MET is mediated in the kidney by transcriptional programs induced by hepatocyte growth factor and bone morphogenic protein-7.51,52 The dynamic tension between EMT and MET normally encourages the preservation of nuclear diapause and a mature epithelial phenotype providing expected physiology. The somatic cues that favor transdifferentiation over EMT still need clarification. The popular perception of terminal differentiation, however, is a problem for the field of epithelial biology and ripe for retirement. Terminal differentiation is at odds with cellular plasticity and cannot persist as a rarified cul-de-sac if cells are to respond adaptively to new environmental cues. While epithelial lineages mature and maintain to ensure unique functions, they also are dynamically poised to change. I suggest the notion of nuclear diapause better reflects what the less attractive concept of terminal differentiation cannot. E.G.N. serves on the Scientific Advisory Board for NephroGenex. E.G.N. is supported by a grant (DK-46282) from the National Institutes of Health. I thank Vivian Siegel, Raymond Harris, Alfred George, Agnes Fogo, and Steven Hebert for thoughtful comments regarding earlier versions of this manuscript. Zeisberg EM, Tarnavski O, Zeisberg M, Dorfman AL, McMullen JR, Gustafsson E, Chandraker A, Yuan X, Pu WT, Roberts AR, Neilson EG, Sayegh MH, Izumo S, Kalluri R: Endothelial to mesenchymal transition contributes to cardiac fibrosis. Nat Med In press. Basic Research in Nephrology: Are We in Decline? Where Is the Epidemic in Kidney Disease?